Yesterday morning Lily and I left for New York so that I could play at the FONT Benefit concert. Plans changed a couple of times literally as we were leaving, which left Lily in a bit of a grouchy mood. It didnt help that she was hungry. We brought peaches and diluted pomegrante juice along with us, but it didn't do too much good. Things got a little better after I repeatedly apologized and she had a granola bar. We first went to Middletown, CT to pick up Martin. We ate first, because at that point both of our stomachs were planning an insurrection. Lily was happy, and so I was. Boy that Cajun Spiced Tempeh was good. That's what I'm talking about. It was nice to return to Middletown, a place that I hadn't been to in about 3 years. As we left, I thought about the future of the defense industry, a major employer of Middletown citizens. Our next destination was Fair Haven, CT, home of Taylor, who finally escaped New York. He and his wife Rachel haven't really finished unpacking yet (the move was recent), but it seems like they are living in a cool little spot. Too bad I've had enough of cities. We continued the journey, finally arriving at the venue, where Nate Wooley (our co-conspirator in trumpet) was waiting for us. I hadn't seen Nate since last year's FONT, so we chatted a bit and caught up. Lily had to go pick up her artwork, which had been hanging at the Supreme Trading bar, which (lot of which's in this sentence) was very close to the venue. She returned shortly thereafter and noted her dismay at the complete lack of a security protocol at Supreme Trading. She simply walked in, said she was taking her artwork, and walked out with it. After we had a short rehearsal, Lily and I braved the hipster wilds of Williamsburg in search of food. We had dinner at Bliss, a spot I hadn't eaten at in years, and then hit up Pennylick's, a new place that has a lot of vegan sweets. It was fun. At least hipsters are down with decent food. 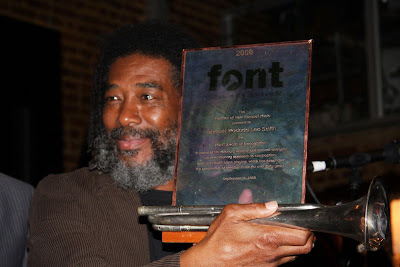 Dave Douglas and Taylor presented an award to Wadada Leo Smith, who this year's festival is honoring. After a couple of short speeches, we opened up the concert with a series of escalating solos, duos, and trios, leading to a fanfare and one of Martin's compositions. I was very satsified with everyone's playing, even my own. 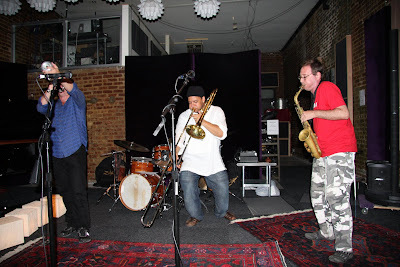 After us John Zorn and Dave Douglas played a duo. I've been listening to John's music for years, ever since I was a teenager, and let me tell you, he put it down. In fact sitting there I found myself a bit embarassed that it took me that long to come see him play. Well minus the time I tried to go see Painkiller in DC in 94 and my dad wouldn't let me go, lol. 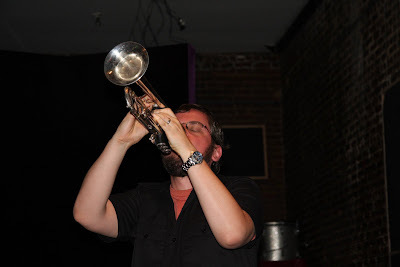 They were joined by Josh Roseman, the proprietor of the venue for an excellent trio. 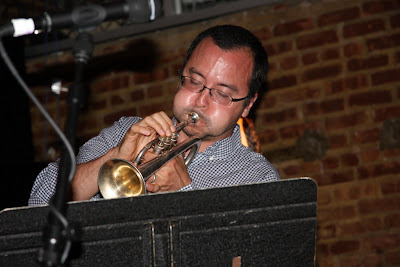 Dave Douglas played with a lot of economy and soul. I was very pleased with the music. Josh did funny dances while he played. He also played great. It was awesome to meet him. 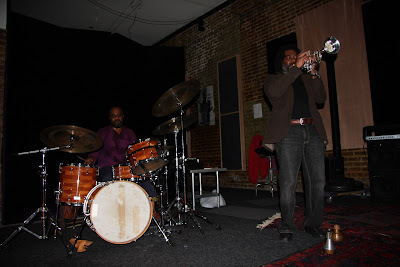 Finally Wadada did a duo with Pheeroan AkLaff, which ranged in texture from the bombastic to the sublime. 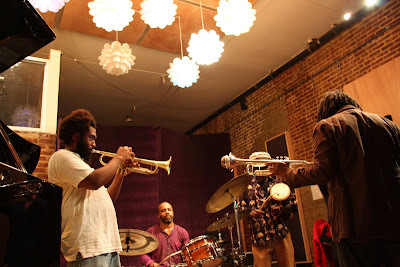 Every time I've seen Wadada play has been great and this was no different. As an encore Dave, Nate, Martin, and myself joined Wadada and Pheeroan for a short piece. Also superb. Basically, I had a great time, everyone was really kind, there were a lot of good vibes all around, and I got to see some friends that live in NYC too. We drove back that night which was pretty punishing. Luckily Martin and Taylor helped. Thanks guys! And everyone else too. 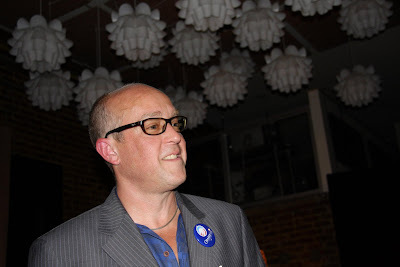 All photos posted by Lillian Schrank.